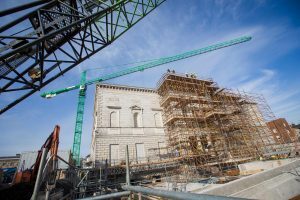 Billed as the biggest refurbishment of the National Gallery since it opened in 1864, this project will generate 250 full-time jobs at peak construction during the summer. The project involves the repair of the Milltown Wing roof, upgrading of the Dargan Wing, the Milltown Wing and the Merrion entrance, whilst upgrading the buildings. There are some unique challenges to the project for main contractor, John Paul Construction, not least working on a site that will remain open to the public throughout. According to Enda O’Rourke, Contracts Manager with John Paul Construction, the logistics of the projects present difficulties. As well as refurbishment the project also involves the installation of a new underground energy centre, the demolition and installation of new lift cores and replacing the existing roof. The “unseen” work also includes the installation of sophisticated alarm systems and a new high-pressure mist system (“galleries and water don’t mix”) that is being installed through 10mm bore holes. As you would expect with a project in Dublin city centre, space is tight. The timing of deliveries has to be exact as there’s no room for trucks to wait. “We use a ‘just in time’ system and that’s backed up by consolidation services on the outskirts of Dublin,” says Enda. When the project is completed, the William Dargan statue, removed in April 2014 to facilitate the energy centre works, will be returned to the forecourt on Merrion Square West. It was the first time in 150 years the statute had been moved.